Bok choy (Brassica rapa), variously known as pak choi, pak choy or bok choi, is an extremely nutrient rich Asian green most commonly used in stir fries, but what is baby bok choy? Are bok choy and baby bok choy the same? Are there different ways to use bok choy vs. baby bok choy? Read on to find out about growing baby bok choy and other baby bok choy information. What is Baby Bok Choy? A cool season vegetable, baby bok choy forms smaller heads than the taller bok choy varietals, about half the size of standard bok choy. Pretty much any variety of bok choy can be grown as baby bok choy but some types, like “Shanghai,” are bred specifically to be harvested at their diminutive height for maximum sweetness. So yes, bok choy and baby bok choy are basically the same. The real difference is in the smaller leaves and even earlier harvest of these tender leaves. Because the leaves are small and tender, they have a sweeter flavor than that of full sized bok choy and can be used in place of other greens in salads. Standard sized bok choy tends to have more of a mustard twang to it too. Both full sized and baby bok choy are low in calories, chock full of Vitamin A and C, and rich in antioxidants and fiber. Both types of bok choy are rapid growers, with baby maturing in about 40 days and full sized bok choy in about 50. It grows best in the cool, shorter days of fall and the early spring. Prepare a sunny area in the garden for planting in the early spring or fall. Work in an inch (2.5 cm.) of compost into the top 6 inches (15 cm.) of soil. Smooth out the soil with a garden rake. Directly sow the seeds 2 inches (5 cm.) apart and ¼ inch (.6 cm.) deep. Water the seeds in well and keep the seeded area moist. Seedlings should appear in about a week and should be thinned to between 4-6 inches (10-15 cm.) apart when they are a few inches (7.5 cm.) tall. Fertilize the baby bok choy 3 weeks after sowing. Keep the planting area consistently moist and free of weeds. Baby bok choy is ready to harvest when it is about 6 inches (15 cm.) in height. 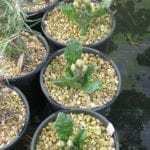 Cut the entire head off just above soil level for dwarf varieties or for full sized varieties, remove outer leaves and allow the rest of the plant to grow to maturity.